Anti-snoring sprays may be an easy solution to the problem of snoring, but choosing the right one can be incredibly hard. However, once you know which features to focus on and what constitutes a good anti-snoring spray, you are just a step away from making the right decision. This Snore Stop Extinguisher VS Snoreeze comparison can help you find out which one of these two products is superior to the other and thus a better match for your needs. Snore Stop Extinguisher provides a homeopathic alternative to all those cumbersome and uncomfortable snoring aids and contraptions. It only requires a single spray every night before bedtime, ridding you of having to wear mouthpieces and similar devices. Snoreeze is a chemical-free throat lubricant that prevents snoring. This snoring aid relies on the soothing, lubricating properties of herbal oils and vitamins and efficiently reduces palatial vibrations while also keeping your breath fresh. Snore Stop Extinguisher can dispense around 120 sprays. It must be used within 6 months after the first use. Snore Stop Extinguisher acts as a lubricant for your throat. Its mix of potent natural ingredients causes the tissue at the back of your throat to shrink, preventing vibrations of any kind. The manufacturer also recommends spraying the areas under your tongue. Snore Stop Extinguisher may also reduce mucus levels and prevent potential inflammation of your airways. Note that it may take up to 7 days to experience noticeable results. Snore Stop Extinguisher has no known side effects. Snore Stop Extinguisher can be returned to the manufacturer at any given moment for a full refund. Snore Stop Extinguisher does not come with a warranty. Snoreeze throat spray (23.5ml) is sufficient for 50 sprays. Snoreeze throat spray contains the following ingredients: - Water - Sorbitan Stearate - Glycerin - Polysorbate 60 - Peppermint Oil - Cellulose - Potassium Sorbate - Tocopheryl Acetate (vitamin E) - Citric Acid - Sodium Benzoate - Hyaluronic Acid - Xantham - Guar Gum Snoreeze doesn't contain any animal-derived ingredients, so it is suitable for vegetarians. Snoreeze throat spray is designed to target the main cause of snoring. Its time-based formula (8 hours) lubricates and tones the soft tissues located at the back of your throat. This prevents your throat muscles from relaxing throughout the night and partially blocking your airflow pathways. You should feel relief and start sleeping better in just a couple of days. Snoreeze throat spray has no known side effects. Due to the nature of the product, Snoreeze cannot be returned to the manufacturer. Due to the nature of the product, Snoreeze does not come with a warranty. The spray works, don't get me wrong. I'm really loving it, but I think it might contain an ingredient that triggers my migraines. So, I'm stuck between a rock and a hard place. If I use the spray, I don't snore but I get migraines. If I don't use it, the migraines are gone but the snoring, choking, and gasping for air every night comes back. I really hate having to stop using it and would definitely recommend it to everyone who don't have the same problem as me. The spray lasts as advertised but the bottle is really small nonetheless. So, after trying countless nasal strips, mild inserts, and other snoring "aids", I finally found something that actually works. The bottle is really small forward the money in my opinion, but at least helps me and my wife get a good night's sleep. I have to say that this product alone doesn’t do it for me. I combine it with a special pillow and my snoring is almost nonexistent now. Honestly, I wasn't even aware I was snoring until my wife couldn't take it no more. We've tried many different snoring aids but they were all so uncomfortable and just a pain to use. 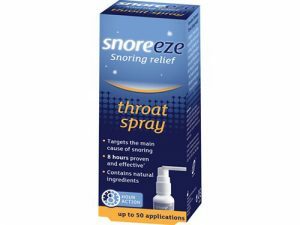 Snoreeze spray takes only a couple of seconds to apply and it has reduced my snoring significantly. I just wish we thought of it sooner, before trying out all those other torture devices. Both me and my wife sleep much better and quieter since we started using this spray. In fact, we love all the Snoreeze products and would recommend them to anybody who's having sleep problems. They are very easy to use and we stock up when we're traveling to Europe to avoid import taxes. I love that in addition to helping me snore less, Snorenz also helps me with my morning breath! LOL But seriously, it’s mint flavored, so yummy. Snorenz did not work for me as much as I had hoped. I thought I was going to stop snoring altogether. I still snore, only much less. I guess that’s something. Snoreeze is an all-natural throat lubricant that prevents the soft palate and uvula from vibrating, thus allowing you to breathe freely and quietly all night long. Discover how effective Snoreeze is in our expert analysis and customers’ Snoreeze reviews.